Unfortunately, I don’t get to see my parents much. They moved down to Florida a long time ago. I would actually move down there, but my fiancé absolutely hates the weather there. So here we stay, 1000 miles away. And, here I am making cheesecake with fresh oranges ,likely from Florida, that tastes like those orange creamsicles my dad loves so much! This cheesecake is decadent, yet light. It’s a from scratch recipe that is perfect for entertaining. Fresh oranges add the best flavor to both the cheesecake and the orange glaze on top. 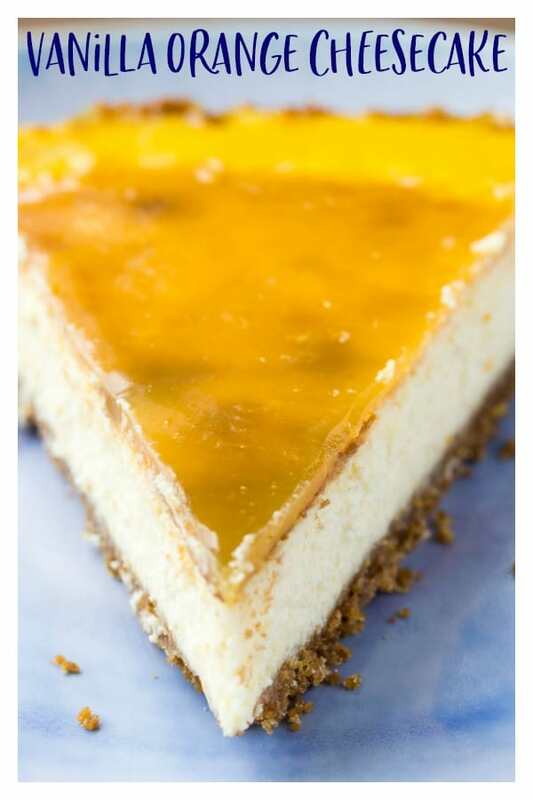 There is orange zest in the cheesecake filling, and the Orange Glaze is made from fresh squeezed orange juice. 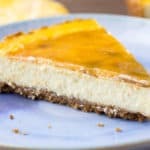 Cheesecake is a great make ahead dessert recipe. Set your cream cheese out to come to room temperature about an hour before you begin preparing the cheesecake. Zest and juice the two oranges and set aside. For the graham cracker crust, melt the butter in the microwave on 15-second increments. Combine the butter with the graham cracker crumbs and sugar until everything is moist. 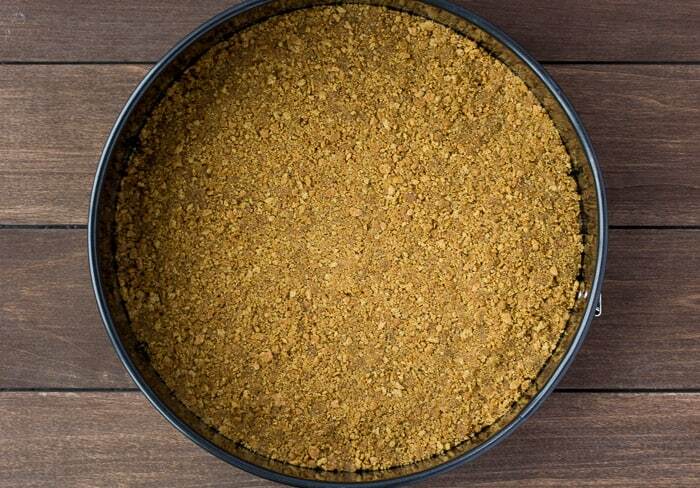 Press the graham crackers crumbs into the bottom of a 10-inch springform pan. If you use a smaller pan, you will need to adjust the baking time a bit. Set aside. To make the filling, add the cream cheese and sugar to the bowl of an electric mixer. Beat until creamy and smooth. Lower the speed and add the vanilla extract and orange zest. Then, add the eggs one at a time. Continue to mix until the eggs are well combined. When the cheesecake has about 15 minutes left of cooking time, prepare the Orange Glaze. Add the orange juice, brown sugar, and corn starch to a small saucepan over medium heat. Once boiling, cook for an additional 15-30 seconds, until the mixture starts to thicken. Remove from the heat. It’s okay if the glaze cools some while the cheesecake finishes baking. Serve as is, or add some fresh whipped cream! Set your cream cheese about an hour before you begin preparing the cheesecake to allow it to come to room temperature. 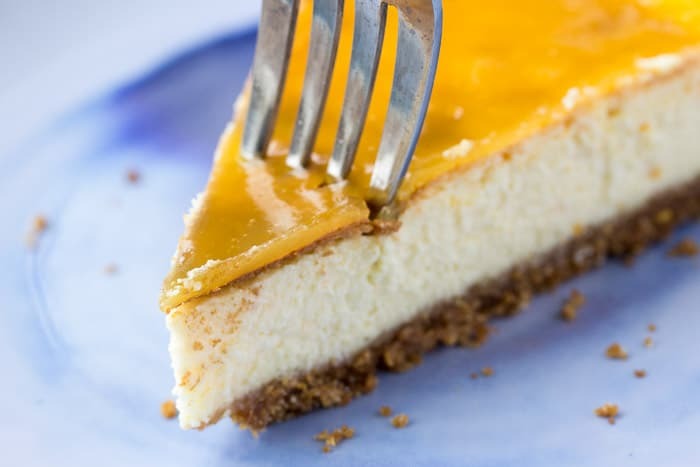 Use a silicone spatula or brush to spread the orange glaze on to the top of the cheesecake. If you use a smaller springform pan, you may need to cook the cheesecake a bit longer since it will be thicker. Store cheesecake loosely covered in the refrigerator and use within a week. You can also freeze cheesecake (without the glaze for best results) in plastic wrap or freezer bags. Use within 6 months. Can you make cheesecake ahead of time? Yes, you can store a cheesecake in the refrigerator for up to a week or in the freezer for up to 6 months. How do you know when a cheesecake is done cooking? Cheesecake is done cooking when it’s still slightly jiggly in the middle, but not soupy. If it starts to crack, it is over-baked. Can you substitute store-bought orange juice for fresh orange juice? Yes, this should work just fine. 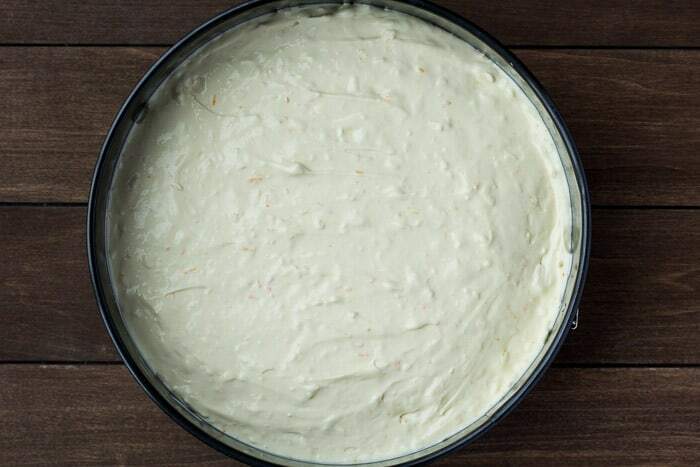 Love this Vanilla Orange Cheesecake recipe? Be sure to follow me on Pinterest, Instagram, and Facebook for more! For the graham cracker crust, melt the butter in the microwave on 15-second increments. Combine with the graham cracker crumbs and sugar until everything is moist. Press into the bottom of a 10-inch spring-form pan. Set aside. Lower the speed and add the vanilla extract and orange zest. Then, add the eggs one at a time. Continue to mix until the eggs are well combined. Place the pan in the preheated oven to bake for 45-50 minutes, or until the center is just slightly jiggly. Add the orange juice, brown sugar, and corn starch to a small saucepan over medium heat. Once boiling, cook for an additional 15-30 seconds, until the mixture starts to thicken. This recipe was originally published on March 21, 2018. It was updated with more thorough instructions, tips, techniques, and FAQ’s in April 2019. Awww your dad is so fun and your story reminded me of my dad. Love this cheesecake and that zesty flavors. What a great combination of flavors! This is the perfect size too… so many cheesecake recipes are just too big, but this is perfect! Love the addition of the fresh zest into the cheesecake batter and that glaze is so pretty! This takes cheesecake to a whole new level. Lovely color too! 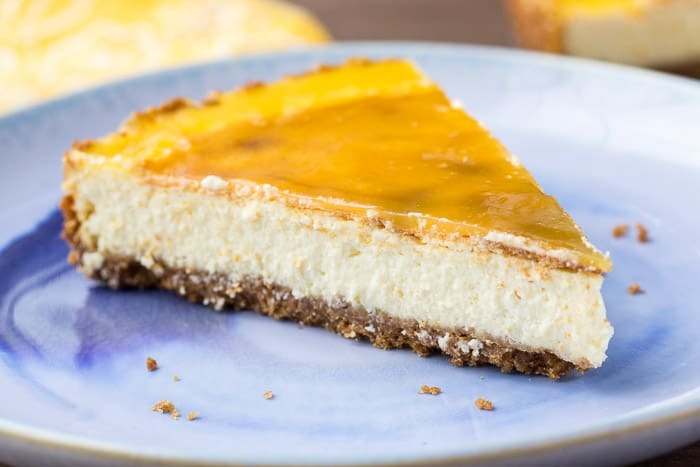 I love the idea of flavoring the cheesecake orange and the glaze finishes it off so nicely along with a great pop of color. Yum! I love vanilla and orange together! I’m sure it tastes like a creamsicle cake! Yum!